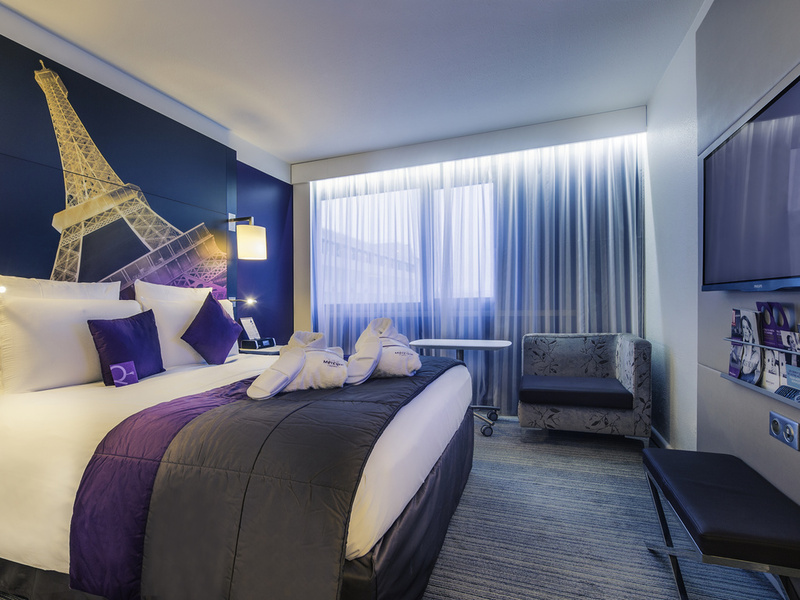 A stone's throw from the Eiffel Tower and Trocadéro, the 4-star Mercure Paris Centre Eiffel Tower hotel is just waiting to be discovered in the heart of Paris. An ideal starting point for your visit, you will appreciate the proximity to public transport and our tips for visiting the City of Light. If you need a setting that combines pleasure and work on a business trip, discover our meeting rooms and relax in our fitness center with a view of the Eiffel Tower or on the restaurant terrace. The central location makes it easy to discover the attractions and shopping opportunities in Paris, thanks to the hotel's close proximity to public transport running day and night. Fully renovated, the hotel offers contemporary and functional rooms with free WIFI access. The hotel offers Standard and Privilege Rooms and Junior Suites, including some with views of the Eiffel Tower for business trips or a leisure stay with your partner or family in central Paris. Make the most of the morning sunshine to savor your meal in this restaurant bathed in light. When the weather is good, you will appreciate the calm of the terrace surrounded by a garden in the heart of Paris. Located on the 1st floor, the Bar Lounge is open all day for business meetings or just to relax. We recently stayed at the Mercure Paris Centre Eiffel Tower for our trip to Paris. The hotel is beautiful, the views of the tower were amazing. The room was clean and everything looked great. What we did not like was the sleep in the bed, the bed was very uncomfortable and the same with the pillows. We prefer a softer bed and softer pillows. It felt like we were sleeping on the ground. You pay the price for the view and the beauty of the hotel, but for the cost, I would expect a comfortable bed to sleep in. Overall a very good hotel and would consider staying at again. Very enjoyable stay , however we felt the bar area lacked atmosphere. I was impressed by great personality of the staffs. I was greeted with respect, and was recognized at all time. The only staff I wasn't quite OK of, was the bartender on the 2nd floor where I went to get the free welcome drink. He was giving a list of things I could get for free with the &quot;not-ok&quot; look on his face. It was like I was asking for free food. Otherwise, great stay - great location. Our family (2 adults, 2 teenagers) enjoyed the stay at the Mercury Hotel Eiffel Tower. The location was great and the staff were very accommodating. Sarah at the front desk was nice enough to call the tour company to confirm our tour when I was not able to. And the cleaning staff kept our rooms neat and tidy! Best of all, the breakfast was great—large selection of breads, pastries, hot and cold items. I would highly recommend this nice hotel! I’m missing 3 items so far that I’ve notice. First was my selfie stick with apple connector attached. Second was my black thermal long johns and third my head scarf. Your maid who caters to the second floor (my room 205) is a outright thief. The hotel is nearby the Eiffel so we can walk to the Eiffel easily. The staff is helpful and friendly. The bus stop to go CDG airport is just at the corner nearby the hotel. Love it!!! Hotel is located in the heart of the city and very convenient for public transportation. The staff is friendly and very helpful. We had a great second stay at the hotel and will definitely return! Overall the experience was ok, but to be honest - I wouldn't stay at this Mercure Hotel again. Room was ok, but the bed is to short if you are over 1,8m. For the platinum benefits - we only got 1 voucher for the bar - normally you get 2 if you travel with 2 People in one room. If you are used to healthy Food, breakfast was a nightmare. My husband and I are vegans, but the only Thing offered was some fruit salad and a lot of sugar loaded sweet stuff. So this was really disappointing. Otherwise Service was ok.
Our experience staying at this hotel was fantastic it was our honeymoon and our room was decorated for us. It was very big and extremely clean. The bed was very soft and comfy. comfortable, convenient and complete ! Very happy with all aspects of our stay, from arriving early and having access to the room(thank you), from the fast check in, to the free minibar, the excellent breakfast and most of all the extremely helpful and responsive staff! I will definitely stay here again for any future Paris visit! The quality of the room is honestly sub par compared to other Mercure hotels and given the price. The staff is also extremely unhelpful and poorly trained. I only stayed 15 hours there as stopover between two flights. The room was good. The bathroom was well designed, but in the morning I had to take a cold shower as there was no warm water. The low ceiling of the entry lobby was depressing. In the afternoon the elevators were broken, and I had to use the fire stairs. I saw people arriving, who carried their luggage up the stairs! The breakfast was okay, but rather conventional. Considering both the hotel’s four stars and Paris’ legacy in hospitality, there is a lot of room for improvement. Invoice was never sent... despite of two promises. You never sent the invoice to me. I prepaid the room and upon leaving I was never emailed my invoice. Way too expensive for what you get. Broken curtains, no warm water in the evening. We enjoyed the hotel but think they have a problem with temperature in bedrooms. It was far too hot and despite turning the thermostat to 0 and having the fan on full it was still too hot. Staff were very welcoming and rooms and beds comfortable.